Dear Readers, I am off to Canada at stupid o’clock on Saturday morning, so I am posting this on Friday evening in order to gain a few precious moments of sleeping time. Normal service will be resumed on my arrival on the other side of the Atlantic. Dear Readers, sometimes luck is on our side. As I walked home along the County Roads on Sunday, something made me look up at some birds perched on a TV aerial. They were whistling to one another in a way that wasn’t right for a starling, the usual occupants of these elevated vantage points. And then, I realised that one of the birds was gobbling down berries from the tree on the corner, and had to run down the road to my house and grab a camera before the visitors disappeared. Because, gentle readers, these were waxwings, and I’ve only seen them once before, during the harsh winter of 2010, when they visited this self-same tree. 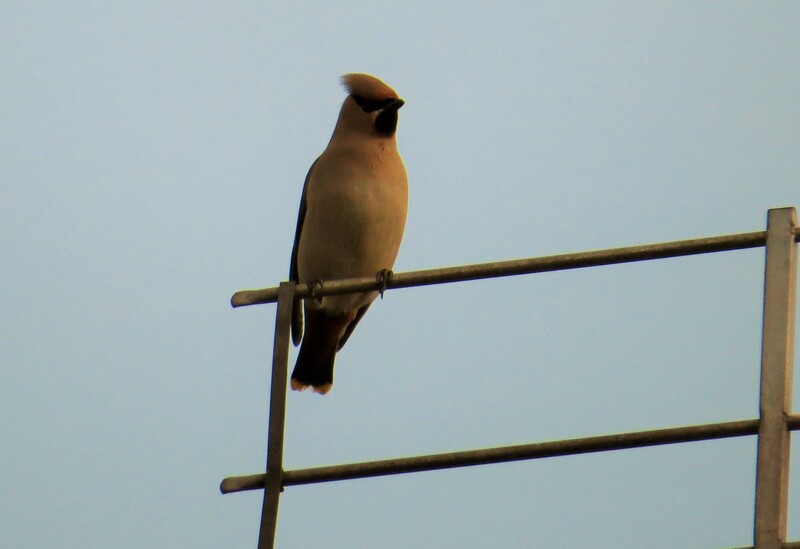 Waxwings are Scandinavian visitors, who ‘irrupt’ into the eastern UK when the berries fail in the northern taiga. I was surprised to see them so late in the year, but relieved that there was still some food for them: by now, passing redwings have often stripped the street trees. 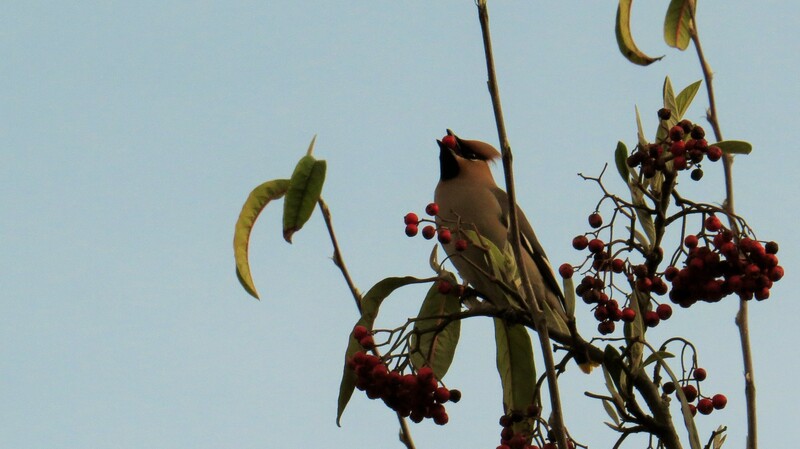 A single waxwing can eat 1000 berries in a single day, so they tend to frequent places like supermarket carparks where the hedging is often of plants like cotoneaster or pyracantha. In Birds Britannica, Mark Cocker and Richard Mabey point out that the birds have been recorded defecating every four minutes as well, which I imagine would produce a very colourful abstract painting beneath any trees that they were feeding from. They can metabolise the alcohol in fermenting fruit, but may become intoxicated, flying into walls and crashing into snowbanks. Couple this with their punkish quiffs and ‘fur-coat’ plumage, and their Goth-style eye-makeup, and you have a bird which is as eccentric and exotic as any late-night reveller in Soho. The birds get their name from what looks like a blob of red sealing wax on their secondary feathers, which you can just about see in the photo below. Although this is still a scarce species for the UK, sightings are becoming more common. The largest flock ever recorded was 367 birds at Lakeside Shopping Centre in 2011 (where I suspect there must be a multitude of berry-bearing bushes), and in 2005 160 birds were spotted in the trees around Warren Street Station in central London. It goes to show that you can see the most extraordinary birds even in the busiest and most congested parts of the city. It’s a good reason for always making sure that you look up (but please don’t fall down an open manhole-cover in the process). Previously, the birds would make landfall in Scotland and work their way south, munching up berries en route. Sometimes, if there is a plentiful supply, they will stay in the area for a few days, but these beauties are always on the move. 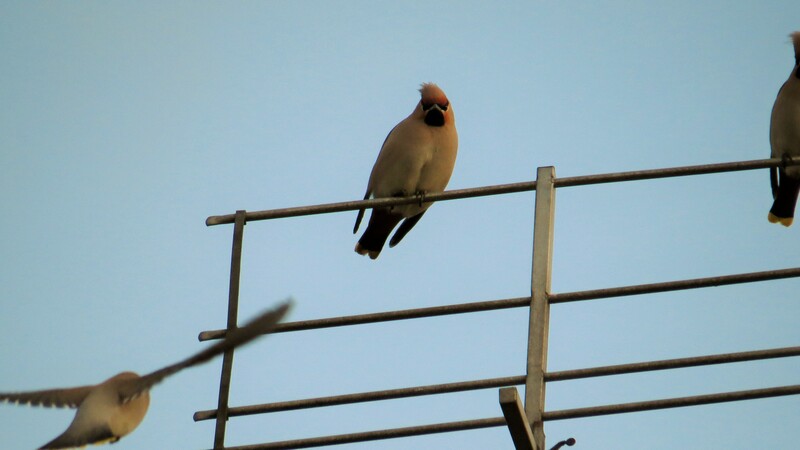 In ‘The Birds of London’, Andrew Self points out that recently, the waxwings have been coming straight to southern England, which may account for the more frequent sightings in the capital these days. Wherever they came from, my tiny flock stayed for a brief sojourn of about ten minutes, before flying off in a chorus of whistles towards North Finchley (though they did put in an appearance every day until Friday). 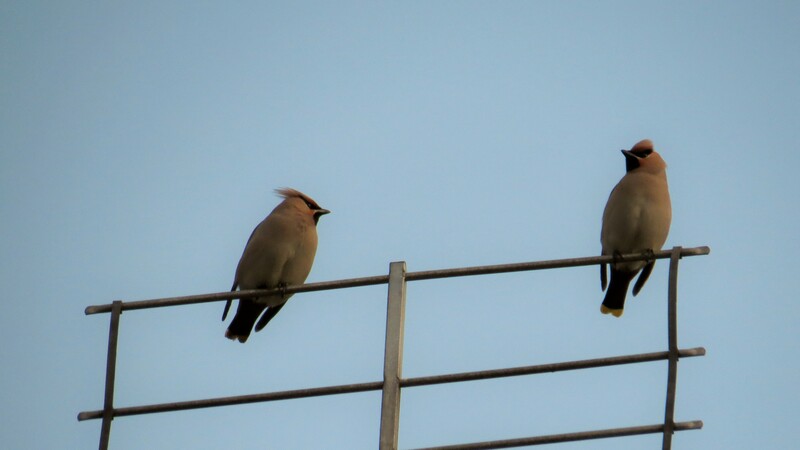 The Latin name for waxwings, Bombycilla, means ‘silk-tail’, and refers to that soft, silky plumage which seems more like a pelage than a coat of feathers. The bird is sometimes called the Bohemian waxwing, and this is more of a reference to its exotic appearance than any claim on the Bohemian region. When I was growing up, all you had to do to be considered Bohemian was wear a shawl, smoke French cigarettes or use eye-liner. I think you’d have to try a bit harder these days. The species name garrulus does not, as you might think, come from any inclination for chattering, but because the bird was thought to resemble a jay. I can see that the soft beige-pink colour is similar, but otherwise I think spectacles are in order. You might think that this beautiful visitor would be a pleasure for anyone, but in the past, their arrival in winter coincided with outbreaks of cholera and plague, and the birds were thought to bring the illnesses, which led to the Dutch and Flemish name for the species, ‘Pestvogel’. They also ate the juniper berries which were thought to prevent these diseases, which would not have made them popular. 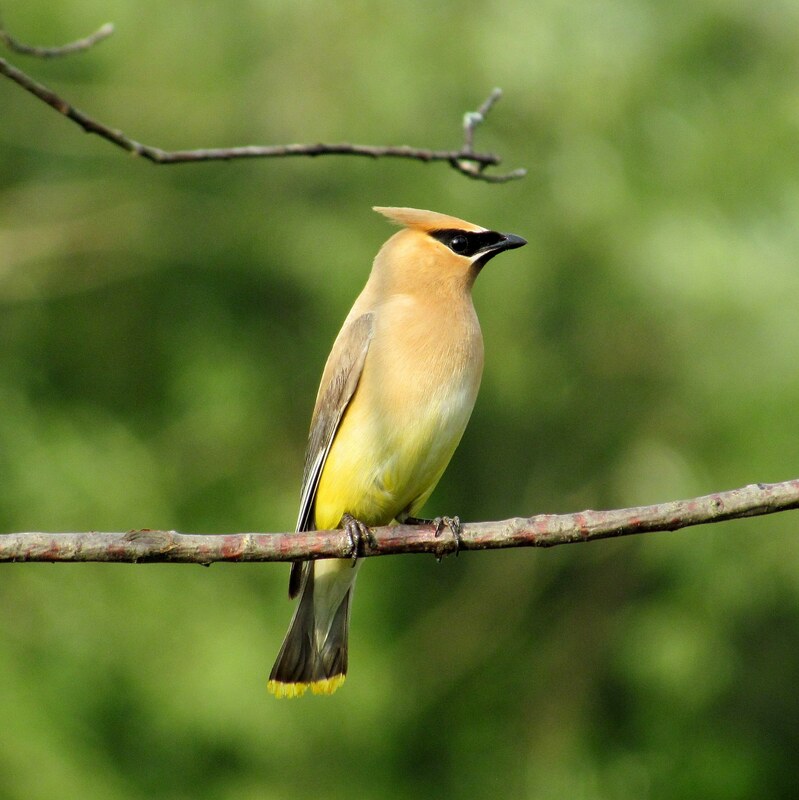 My North American readers might be more familiar with the cedar waxwing (Bombycilla cedrorum), a slightly smaller, more yellow bird. The Bohemian waxwing is generally found a little further north in Canada than the cedar waxwing, but there is some overlap, so any lucky Canadian readers might get to see both species as they travel back and forth from their wintering grounds to their breeding areas (the birds, not the Canadians). Waxwings are not considered an endangered species, in spite of flying drunk and endangering themselves by eating snow contaminated with salt and antifreeze. They breed in the taiga forests and the high northern plains, where they eat berries and midges (and heaven be praised for the latter). But they are still relatively unusual in the UK, and whenever I see them, I am forced, like the Ancient Mariner, to grab passersby with my bony hand and force them to have a few moments impromptu birdwatching. They’ll thank me for it later, I’m sure they will. All other blog content free to use and share, but please attribute and link back to the blog, thank you! This entry was posted in London Birds on April 21, 2017 by Bug Woman. Have just found your blog today and so glad I have. Personally I have never seen a waxwing but will keep looking. Thankyou for a really interesting site. Thank you Briony, so glad you’re enjoying the blog – welcome! Cedar waxwings are my favorite bird. One afternoon I watched a whole flock of them strip the hawthorn berries from the tree by the creek. I felt so privileged to see them. They seem so sober with their mostly yellowish, olive tan, but then you see the wing tips like a brightly colored silk handkerchief in a gentleman’s pocket. Lately I have had a problem with them–their jaunty caps remind me of Donald Trump’s hair! ‘Like a brightly coloured silk handkerchief in a gentleman’s pocket’ – what a perfect description, Lynn! What a glorious bird. Seems impossibly exotic to be seen in suburban England. That is a great line. I’m not surprised you couldn’t resist it :-). I like your attitude – forcing people to impromptu bird watching. Indeed. I force them into impromptu plant appreciation and rainbow watching as well. It’s for people’s own good! 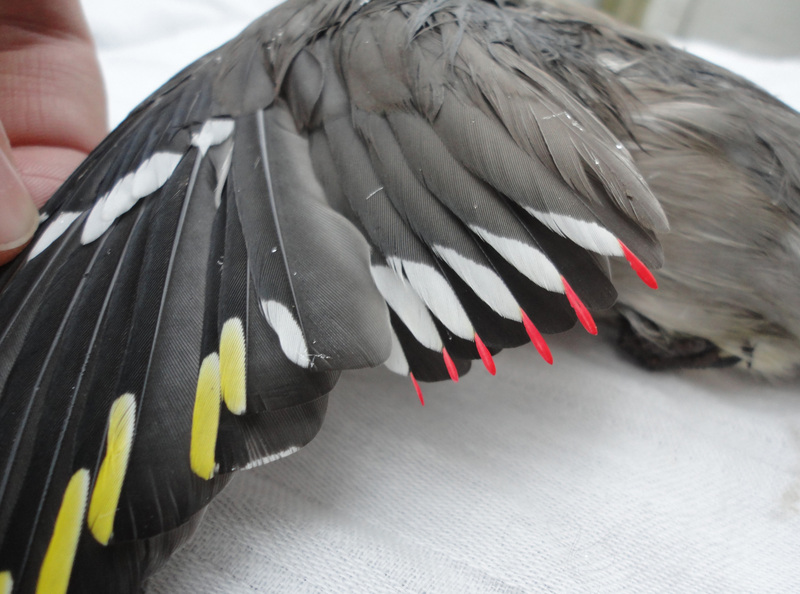 How I’d love to see some wax wings! A couple of years ago my OH was astonished when looking out of his window at work – he’s based in an industrial estate – he saw the car park was full of people; media units and film crews. A flock of waxwings had arrived and were settled in a tree. 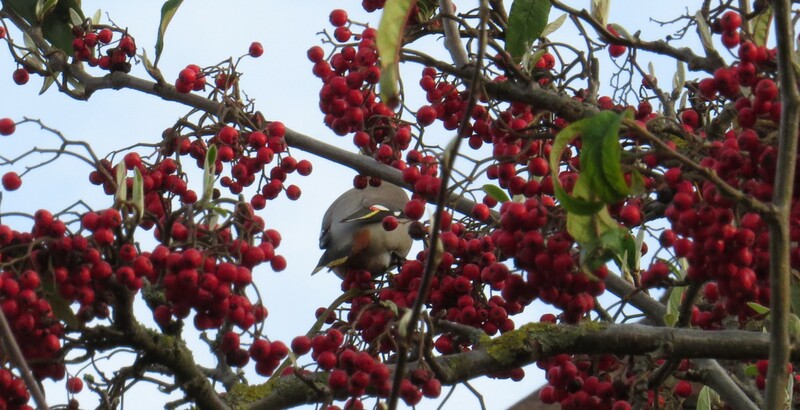 There is a lot of hedging with a variety of berries in that estate and was probably why the wax wings were there. I was cross he hadn’t contacted me so I could have seen them! I hope you told him that such behaviour was unacceptable :-). Waxwings do love anywhere with berries, which is one reason why supermarket carparks with lots of cotoneaster and pyracantha are great favourites. We saw our first ever waxwings in April when a flock stopped for a rest in our weeping willow. They put on quite a show. I thought I’d pass out from joy and as luck would have it, I did not have a camera. My mister took several very poor shots with his iPhone, but they weren’t worth saving. 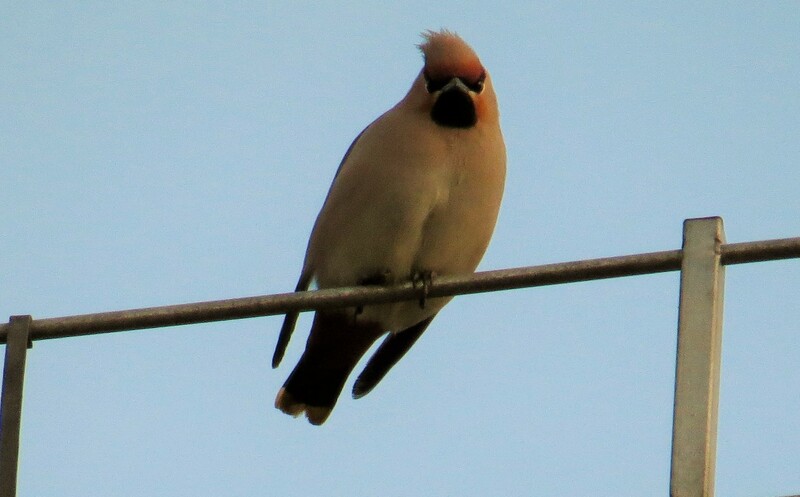 No one told me waxwings visited Texas! I find that I am nearly always camera-less when something spectacular happens, but oh! the memories….